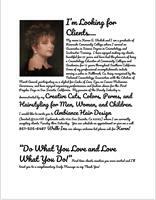 Karen A. Stadick is accepting clients at Ambiance Hair Design Tuesday thru Saturday. Walk-ins welcome or call for an appointment 951-505-6487. Perm Special: $75.00 includes cut and style(long hair needs consultation).